Last edited by UnlikeUday on Sun Apr 08, 2018 5:13 pm, edited 1 time in total. Exediron's Curse strikes again. Whatever two cars I choose to promote with my strategic penalty are guaranteed a double DNF! I have to put my prediction for China up now already. Bah only 81 I think, had Sainz finished one place higher it would have been a decent 106. I scored 95, sorry I'm a bit late today with the scores, I've been a bit busy, I'm on with it now. The start of the race saw pole man Vettel take the lead but fellow front row starter Raikkonen got past by Bottas into second place. Much further back on the grid Hamilton and Verstappen had a coming together when Verstappen ran Hamilton wide coming out of a corner which punctured Verstappen's left rear tyre and would lead to him retiring. Further up the field Ricciardo pulled off the track with an engine failure which necessitated a VSC, not a good start for Red Bull with both cars retiring in the opening laps. Hamilton made his way from 9th on the grid up to 4th and then took the lead when the 3 leaders all pitted one after the other, however it wasn't long before Vettel had caught and passed Hamilton using his fresher tyres and then Hamilton himself pitted. 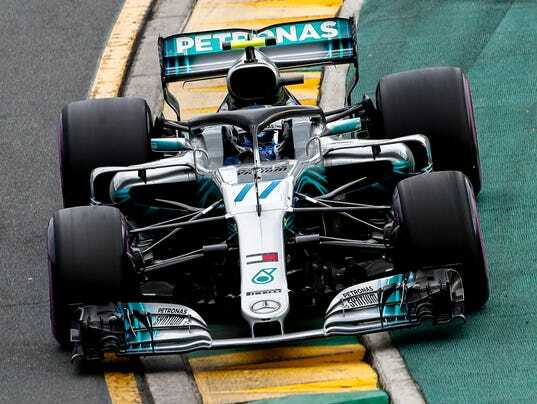 Both the Mercedes cars pitted for the harder medium tyres so they would not need to pit again to try and gain track position on Ferrari when they pitted for the second time . Raikkonen pitted again but the left rear was stuck on the car and then mistakenly Raikkonen was given a green light to leave the pits with the mechanic still working on the car, the mechanic was badly injured having had his leg broken and Raikkonen's car was retired having immediately stopped near his garage. This lead to Ferrari changing Vettel's strategy and leaving him out on the soft tyres to the end of the race, this was a risky strategy and indeed Vettel started to lose grip badly with 10 laps to go which enabled Bottas to close within DRS range with 2 laps to go but he was unable to pass, Hamilton finished third and in a superb 4th place was Gasly in the STR Honda. In third place with 101 points and receiving the "Happy Hamilton Trophy"
In second place with 108 points and receiving the "Battling Bottas Trophy"
In first place with 113 points and receiving the "Victorious Vettel Trophy"
Last edited by pokerman on Mon Apr 09, 2018 11:55 am, edited 1 time in total. I just barely edged out Titanium... I should probably be nice to the guy carrying our team in the pick 3 tournament though! Last edited by pokerman on Mon Apr 09, 2018 11:57 am, edited 1 time in total. I would be really surprised if anyone could have predicted that race. Both the Red Bull retirements and Gasly's epic drive really shocked me. Hope I go a little better in China. One nice feature I had in mind for the race result post would be to show the round winner's picks and their points? Would give some further insight to what they did right. However I do appreciate running this competition is a lot of work for you already as it is, poker. I have no idea what I did right! I am amazed to win. I thought when Sainz lost p10 on the last lap I was going to be nowhere. But it was such a low scoring race maybe getting 3 of my 4 from the P7-10 slots helped. You did better than two thirds of the entrants so you didn't do that bad. You know it's not that hard to see exactly who they picked. The key pick was Vandoorne who not many picked and scoring 18 points. I've just checked and only 3 people chose Vandoorne however I'm glad I did this as it's thrown up an error on my part I mistakenly inputted Vandoorne instead of Verstappen for Icemanjee1 which is going to throw him off the podium, when I input the V it initially defaulted to Vandoorne then I needed to input the E for Verstappen which I didn't do, this being a force of habit over the past few year with the V nearly always defaulting to Verstappen, amendment on its way. Thought with both Red Bull boys out that my Pick 10 would be completely in the toilet... to get a podium, i'm shocked! Something else to finally put in my signature! A podium in only your second race, not bad, it took me over 2 years. Not too bad this time you only lost 7 points, TheDamus also lost 7 points with his strategic strategy. Is there an award for the best Rookie? Yes paul85 won it last year after finishing 3rd in the competition, he's presently 2nd this year, as a thought I should highlight who are the rookies this year, I'll do it after the next round as new players sometimes drop out early on. Ha, actually I forgot But, I must admit, I wouldn't have voted for a Vettel win before the 2 FPs, so the penalty is deserved. It might have been a worse score for me I think without doing that. Still, I shouldn't get all worked up about finishing near the bottom. Oh well! No I compared it with your original picks. The midfield is getting hard to pick. I still think the Bulls have more pace than they've shown so far. Are you sticking or twisting this time? At this early stage of the season there's nothing set in stone plus unlike the last couple of years we don't seem to have runaway leaders so it's very open for anyone to win at this point. I'm 'only' 84 points behind the current leader, so all I need to do is score an average of about 5 points per race more than anyone else to take the trophy at season's end. I'm not ready to admit that strategic penalties are just a slower way to shoot yourself in the foot quite yet, so I'll keep trying it until it either works or I decide it never will. My first two blew up spectacularly, but in each case I think with a normal race I would have either not lost many points compared to where I would have been otherwise. There's been quite a lot of unreliability so far this year, and I think that's screwing with the results a little. Either way, I'm enjoying testing my penalty theory so far, so we'll see where it takes me. Last edited by TypingChicane on Thu Apr 12, 2018 9:22 pm, edited 1 time in total.